As Cuba may be approaching a political and social transition, there is increasing interest in the South Florida community regarding planning improvements for its decaying infrastructure. Those who have attempted to work on this subject have met the complex challenge of working with the very limited data and often unverifiable information that is published by the Cuban government. Our University of Miami senior environmental engineering team took on this planning challenge by tackling a sanitary infrastructure issue of great importance to the country, namely, providing wastewater treatment in an underserved community to improve receiving water quality and public health. After performing extensive research on the conditions of the sanitary infrastructure of Cuba, one major problem was identified in the Municipality of Cotorro, in the Province of Havana. This municipality’s domestic sewage is currently being discharged with no treatment into the upper tributaries of the Almendares River, which shortly after flows into the Ejército Rebelde (Paso Seco) Reservoir. The river, as well as the reservoir, is hydrologically connected to the Vento Aquifer. This aquifer is very important to Havana because it serves as the source of over 50% of the potable water in the province. Even though there have not yet been signs of contamination found in the aquifer water, it is important to prevent such pollution because once it is detected in an aquifer, it is usually too costly and difficult to remediate . 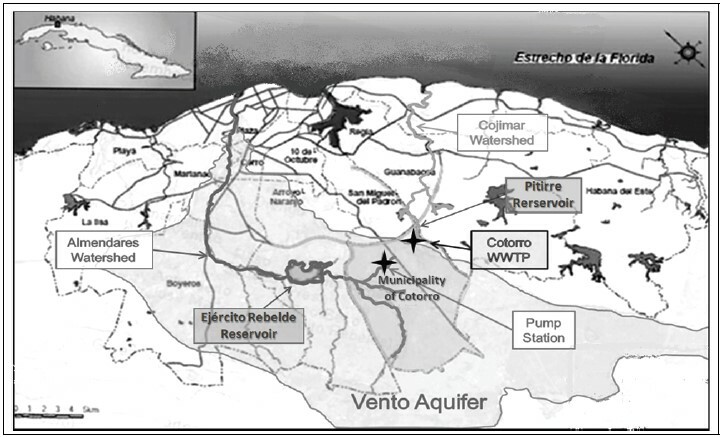 The potential contamination of the Vento Aquifer, and the unsanitary conditions of the Almendares River provided the basis for the design solutions set out in this paper. Cotorro is a municipality located to the southeast of the city of Havana, the capital of Cuba (Figure 1). It is located at the center of an important freeway network system that serves as its limits. It encompasses an area of 65 square kilometers. More than half of its total area (about 56%) is devoted to agriculture. Of the remaining land, 22% is occupied by water and the rest is not suitable for agriculture (JCCC 2008). According to the latest population census, there are approximately 74,500 people residing in Cotorro. The population density is about 1,131/km2. There are 24,953 housing units, 253 work centers and 108 small family clinic facilities (JCCC 2008). The Municipality of Cotorro is located within the region of the Vento Aquifer, in the surroundings of the upper Almendares River and its intermittent tributaries—Jicotea, Chaelote, Limón and San Francisco (Figure 1). Climate characteristics for this city are tropical with hot, humid summers, and warm, dry winters. Located in the Caribbean, the city experiences its warmest temperatures in August with averages around 26.5 °C (80°F), and its coldest temperatures in January at 19.8°C (68°F). The average humidity is at 81.7%, which is typical for a tropical climate. Cotorro’s average yearly rainfall is 1567.8mm (JCCC2008). In the municipality of Cotorro, domestic sewage is not properly treated. A few houses have septic tanks; other homes are connected to pipes that discharge their waste directly into streams, and the wastewater from those that are connected to the existing sewer collection system ends up in the local streams with no previous treatment. All of these impaired streams and tributaries run into the upper section of the Almendares River, which discharges its waters into the Ejército Rebelde (Paso Seco) Reservoir. There is great concern for the future of the Vento Aquifer, and local and regional authorities have realized the paramount importance of the contamination issue of the Almendares River. To tackle the problem, a sewage collection system was built in the 1980s, with the goal of collecting and pumping the wastewater outside of the Vento-Almendares hydrologic system. The San Pedro Pump Station, built in the 1990s to move the collected wastewater away from the city, has never worked properly. As new funding from the Organization of Petroleum Exporting Countries (OPEC) is made available, new decontamination plans are being implemented. The plans include building additional sewer collection lines that will serve the entire urban population, the restoration of the San Pedro pump station, and the construction of a holding tank and a wastewater treatment plant that will discharge treated water via an interbasin transfer into the Cojimar watershed, away from the Vento Aquifer. Currently in Cotorro, the sewer collection system is under construction, with a schedule to be completed within the next five years. The pump station, as well as the holding tank, has been in place for some time. The piping system connecting the San Pedro pump station and the holding tank have already been built. The municipality’s plan also includes the construction of a wastewater treatment plant downstream of the holding tank. The aim of this report is to present a conceptual design for that Wastewater Treatment Plant. The main constituents of the project are the San Pedro Pump station and the proposed Cotorro Wastewater Treatment plant (WWTP) (Figure 2). The pump station is located on the west side of the city, at a lower elevation than that of the town. Wastewater moves through the sewer lines in the city by gravity to the pump station, where the wastewater is then pumped back over the high ridge of Cotorro to the future Cotorro WWTP. The wastewater will be treated at the plant and then discharged across a hydrologic basin divide into the Pitirre reservoir, which is connected to the Cojimar River. The treated water eventually will make its way into the ocean on the northern coast of the island. This project aims to develop the conceptual design of an effective and economically responsible wastewater treatment plant for the municipality of Cotorro. The plant will use as many sustainable and energy efficient concepts as possible, while still keeping construction and maintenance costs low. The over-arching goal of the project is to prevent the contamination of the Vento aquifer, while also minimizing the environmental impacts on the surrounding ecosystems. The design process included taking into account the advantages and disadvantages of different unit processes, analyzing their technical details, and determining the removal efficiency of each unit operation. In addition, costs of design, construction and maintenance, and durability were other factors used in the selection of the design process. The construction of preliminary and primary treatment processes for the proposed Wastewater Treatment Plant, as well as the disinfection units. The sludge treatment processes will also be included in this phase. This phase includes the addition of biological treatment to the plant for further biochemical oxygen demand (BOD) removal so that the effluent water meets the national total suspended solids (TSS) and BOD discharge standards. The addition of tertiary treatment to the wastewater treatment plant will make sure that the highest effluent quality standards are met in the final phase. This additional treatment is recognized as an extremely futuristic plan. In order to design a wastewater treatment plant for Cotorro, the characteristics of the influent were determined. This information was unavailable through research, and therefore educated assumptions using typical values from the U.S. Environmental Protection Agency (EPA), along with information from engineering literature, the United Nations, and the Puerto Rico Aqueduct and Sewer Authority were used to calculate wastewater generated per capita, and the concentrations of biochemical oxygen demand (BOD) and total suspended solids (TSS). These parameters are used to measure the relative ecological impacts of the waste—the lower the concentrations, the lower the impacts when discharged to the environment. The amount of wastewater generated per person was calculated to be 100 gallons per day (GD), including typical water use per capita, infiltration and inflow, and industrial water use. The projected population—with a design period of 25 years and a growth rate of 0.37%— was calculated to be 82,500 people. Therefore, the projected average flow rate for the wastewater treatment plant was estimated at about 8.25 million gallons per day (MGD). With this flow rate, the BOD was estimated at 240 mg/L, and the TSS concentration is 300 mg/L. Another parameter that is used to evaluate wastewater discharge is nutrient content, primarily nitrogen and phosphorus. Presently, nutrient removal is not mandated in the United States; however, as part of the design considerations for the town of Cotorro, various options for nutrient removal processes were examined. Currently in Cotorro, there exists a sewer collection system and a pump station. According to local officials, the sewer collection system is going to be revamped, and new sewer lines, of twenty-four inch diameter, will be installed throughout the entire municipality within the next five years. The wastewater from the sewer lines will travel by gravity to the San Pedro pump station, where it will be pressurized to travel two kilometers across the city to an already existing holding tank, where the water will then be discharged by gravity to the new wastewater treatment plant. The pump station was rebuilt fifteen years ago, and its purpose was to lift the wastewater to the zone of the Pitirre reservoir, which would keep the contaminated water away from the Almendares River and Vento Aquifer; and instead direct its flow into the Cojimar watershed. Currently, because the pump station is not working, the wastewater from Cotorro is bypassing the lift station and being directly discharged into a stream connected to the Ejercito Rebelde reservoir. At the entering pool of the pump station, there are manually- cleaned screens, which will be utilized as part of our treatment design. The station includes two big pumps and four smaller ones. The combined pumping capacity of these six pumps is 64.8 m3/min (24.6 MGD). The pumps are thus adequate to send the projected amount of wastewater flow over to the holding tank and the planned Cotorro wastewater treatment plant. Based upon previous assumptions, the influent water to the treatment plant is characterized with medium quality. The unit processes within the WWTP are designed to efficiently reduce the influent BOD and TSS to the standard levels for Cuba, as well as United States EPA standards of 30 mg/L. A major consideration and goal of the design is to maintain the ecology of the receiving water bodies. 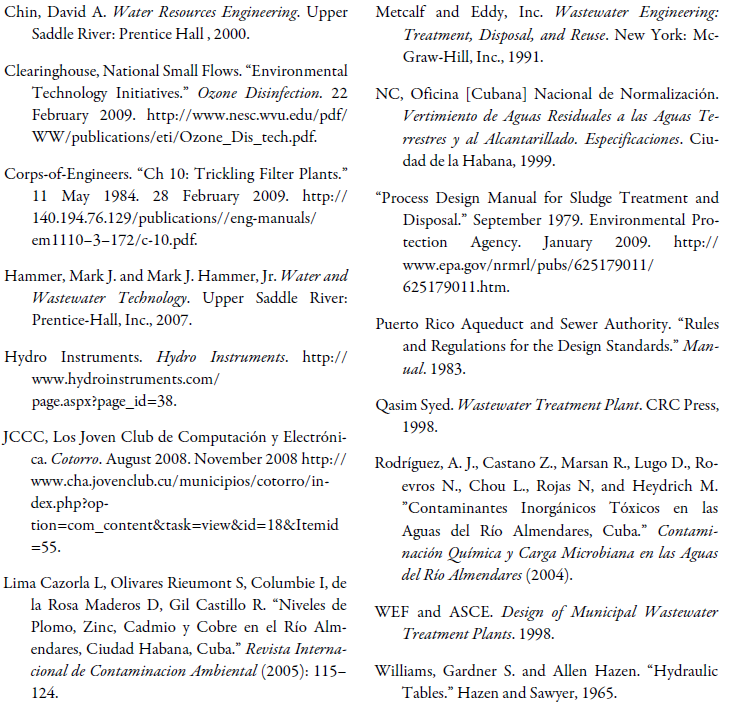 After studying treatment systems used within other Caribbean islands such as Puerto Rico, the Virgin Islands and Trinidad and Tobago, and the existing Maria Del Carmen WWTP in Havana, we found that these plants have several common treatment processes, namely: primary sedimentation, biological filtration, secondary sedimentation, and sludge digestion. Accordingly, we formulated the proposed treatment processes displayed by Figure 3. Treatment units are designed for ultimate performance when all units are working. However, the design will also allow for one unit to be offline for maintenance purposes, upholding the adequate treatment and compliance with recommended loadings and removal rates. Screening: Screening is the first stage of the pretreatment process that is necessary to remove large objects such as rags, paper, plastics, trash, and metals. Removal of these solids prevents damage to the pumping equipment, sludge removal equipment, hang-over weirs, valves, nozzles, channels, or pipelines. Due to the unique design of the WWTP, the bar racks will be placed prior to the pumps at the San Pedro Pump Station. Grit removal: Grit removal is the second phase of the pre-treatment process; in the grit chamber all other materials in the wastewater that are heavier than organic matter are removed. Common substances removed are sand, dust, cinder, bone chips, coffee grounds, seeds, and eggshells. This extra step is used to further protect the equipment against wear, prevent clogging, and reduce build up of materials in other processing stages. Different types of grit chambers were evaluated for potential use in the Cotorro WWTP; consequently, based on the analysis of each type of grit chamber, we chose an aerated grit chamber, which will deliver proper pretreatment in one easy step. Metering: Metering systems are built in to the treatment plant to measure the flow rate of the incoming wastewater. An effective metering system is the parshall flume, and this device was selected for our design. Primary Treatment: Settling, or clarification, is performed in rectangular or circular tanks where the wastewater is held quiescent to permit particulate solids to settle out of suspension. To prevent short-circuiting and hydraulic disturbances in the tank, flow enters behind a baffle to dissipate inlet velocity. Overflow weirs, placed near the effluent channel, are arranged to provide uniform effluent flow. Floating materials are prevented from discharge with the liquid overflow by placing a baffle in front of the weir. A mechanical skimmer collects and deposits the scum in a pit outside the tank. Settled sludge is slowly moved toward a hopper in the tank bottom by a collector arm (Hammer and Hammer 2007). In order to determine the type of sedimentation tank to be used, advantages and disadvantages were evaluated for the circular and rectangular tank alternatives. We selected circular clarifier tanks because they have lower capital and maintenance costs and they can achieve greater weir lengths. In these clarifiers, raw wastewater enters through ports in the top of a central vertical pipe into a center wall baffle then flows radially to a peripheral effluent weir. The center well directs flow downward to reduce short-circuiting across the top. Disinfection: The process of disinfection includes the inactivation of pathogenic organisms, such as enteric bacteria, viruses, and protozoa. The purpose for disinfecting wastewater effluent is to protect public health. There are 3 main methods of disinfection used for wastewater treatment: chlorination, ozone, and UV. Based on its cost-effectiveness, advantages over the other technologies, and its traditional use, chlorination was selected as the disinfection process for the Cotorro WWTP. Additionally, the potable water in Havana is disinfected through chlorination and therefore the chemicals are presumed to be readily available. Moreover, the gas chlorination system was chosen for the design based on its clear economic and practical advantages over other available technologies such as calcium and sodium hypochlorite. Admittedly, the initial capital investment for a chlorine gas system is slightly higher than for hypochlorite treatment; however, the savings in chemical cost far outweigh the equipment costs (Hydro Instruments). Sludge Treatment: Sludge, a mostly wet mixture of suspended solids and wastewater, is generated at both the primary settling tank and the trickling filters. For the Cotorro wastewater treatment plant to be sustainable, the sludge will be treated so that it can be used as a soil conditioner or fertilizer in the agricultural region of the municipality. To achieve this goal, calculations were performed to determine the amount of sludge being generated based on the incoming flow rate projected at the wastewater treatment plant, and the assumed wastewater characteristics regarding the total suspended solids. The calculated volume of sludge is about 14,100 lb/d. To treat this amount of sludge, the following processes were selected based on their effectiveness for a tropical region, and their low cost: preliminary blending, thickening by gravity, stabilization in an anaerobic digester, and final dewatering on a paved drying bed. Each of these treatment units were sized for the daily generation of sludge, and the final product will be safe and dry enough to use for agricultural purposes. The preliminary treatment helps to make the sludge from the two sources into a homogenous mixture; the gravity settling helps to thicken the sludge and remove some of the water; stabilizing the sludge helps to remove odors and destroy any pathogens; and laying out the sludge in a thin layer to dry in the sludge turns the “waste” product into a resource. From the anaerobic digester, energy can also be generated from the methane gas being produced. Secondary Biological Treatment: Secondary biological treatment is designed to remove dissolved organic matter from wastewater, which in turn reduces BOD. Sewage microorganisms are cultivated and added to the wastewater. In turn, these microorganisms absorb organic matter from the sewage as their food supply. There are three main alternative categories used to achieve secondary treatment: fixed film, suspended film and lagoon systems. A fixed film alternative was determined to be the most suitable choice for Cotorro WWTP, because it is a relatively inexpensive alternative that works well in tropical climates. After performing a thorough investigation of the biological processes available, it was concluded that the tricking filter with a rock media best fits the desired WWTP design because it is very efficient, simple, and economical. It works very well in tropical climates and consequently it is commonly used in islands of the Caribbean. The suspended film processes (activated sludge and oxidation ditch) entail a higher energy use and more complex operation. A trickling filter is an aerobic sewage treatment method in which the sewage is dispersed via a revolving sprinkler suspended over a bed of porous material. The base material for the selected trickling filter is crushed stone, with a depth of 6 feet above the under drain system. The influent sewage slowly moves through the porous bed and the effluent is collected at the bottom. The crushed stone eventually becomes coated with a microbial community that absorbs and breaks down dissolved organic nutrients in the sewage; thus considerably reducing the BOD. This process is also aerated by the movement of air through the spaces between the stones. Secondary Settling Tank: Settling tanks that follow biological filters are similar to primary clarifiers. For secondary settling tanks, the same choice of circular vs. rectangular tank exists, and due to reasons discussed in the previous sections, circular clarification tanks were chosen. The purpose of gravity settling following a trickling filter is to collect biological growth, or humus, flushed from the filter media. These sloughed solids are generally well-oxidized particles that settle readily (Hammer and Hammer 2007). These biosolids are returned to the primary sedimentation tank where they re-settle and then are pumped to the sludge treatment units. This recycling system also serves the purpose of facilitating the control of an equalized flow through the plant, and the proper recycling of treated water through the trickling filters. The idea for the addition of tertiary treatment to the Cotorro WWTP is acknowledged as a very futuristic plan. Tertiary treatment technologies are expensive, and usually not required by the regulatory agencies. However, laws are beginning to become more stringent, and people are beginning to realize that the water discharged today is the water they will be drinking tomorrow. It is important then to provide an insight into the current available technology that would best fit into the design for Cotorro, and would provide treatment necessary for compliance of more stringent regulations. The main priorities for the implementation of tertiary treatment in Cotorro are to achieve nitrogen and phosphorous removal and additional suspended solids removal. Due to its ability to achieve successful removal of both suspended solids and dissolved nutrients, the recommendation is that a high rate, up-flow biological fixed-film system be used. These systems employ a proprietary dense granular support media that acts as a biological contactor as well as a filter. Both the influent wastewater and process air flow from the bottom of the unit in an upward direction. This allows the water with the highest pollutant load to contact the media where the dissolved oxygen level is the greatest. 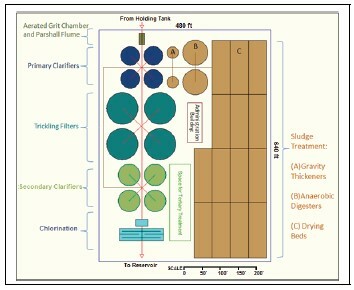 Figure 4 displays the layout of the treatment units within the Cotorro WWTP. The proposed treatment train, including up to Phase II, encompasses two aerated grit chambers, a Parshall flume, four circular primary clarifiers, four trickling filters, four circular secondary clarifiers and disinfection by gas chlorination with two contact basins. In addition, a set of units are included for the treatment and recycling of the biosolids generated at the plant. Each of the treatment units selected for the Cotorro Wastewater treatment plant works to reduce the concentrations of BOD, TSS, and nutrients. From our selected processes, the wastewater effluent will meet the quality characteristics of a Class “B” water body (“rivers, reservoirs and hydrogeologic zones which are utilized for irrigation, where products may be consumed raw, or for recreational purposes”) as defined by the Cuban government. The final characteristics of the wastewater after secondary treatment are: BOD = 18 mg/L, TSS = 13 mg/L, Total Phosphorus = 4 mg/L, and Total Nitrogen = 22 mg/L. For the effluent to meet the characteristics of a Class “A” discharge (“rivers, reservoirs and hydrogeologic zones which are utilized as a source of potable water for public use and/or industrial use for the processing of food”), the tertiary treatment, which will further remove nutrients and suspended solids in the wastewater, needs to be implemented. A Class “A” effluent will not have any harmful effects on the local ecosystem or environment, and will also prevent public health issues within the communities of people living along the Cojimar River. In order to achieve the goals of cost-effectiveness while providing the best treatment for the wastewater in Cotorro, the plant was designed to operate entirely by gravity. If the wastewater can flow without the use of pumps or other energy intensive units, the cost and maintenance of the plant can be lowered. By analyzing the topography of the Cotorro region, specifically in the north-east corner where the treatment plant would be located, it was determined that there is approximately 25 feet of elevation difference from where the wastewater enters the plant to the effluent point after the chlorine contact basin. There is an additional 25 ft elevation difference between this point and the effluent point at the reservoir where the treated wastewater would be discharged. Using the Hazen-Williams tables for head loss within pipes and typical head loss values for each of the treatment units (Metcalf and Eddy 1991), the hydraulic head loss through the plant was calculated. It was verified that the proper head will be available for the Cotorro WWTP to operate on gravity, saving costs and also taking advantage of the local environment and topography. 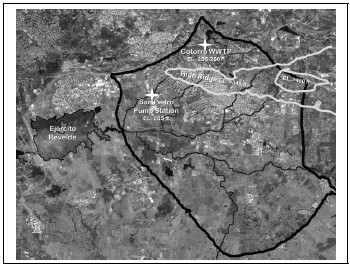 As the local and regional authorities have realized the importance of the contamination of the Almendares River, and how the elevated contamination inputs of the wastewater discharge in Cotorro contributes to the impairment of this watershed, a plan has been put in place to revert the current situation. The conceptual design of the Cotorro WWTP described in this report is a very essential part of addressing current pollution problems. This conceptual WWTP design proposed for Cotorro in the short term consists of up to secondary treatment. With the proposed design, Cotorro’s WWTP effluent characteristics would comply in the short term with Class “B” standards, and it has the potential—with the addition of the tertiary treatment—to comply with Class “A” standards. Therefore, a futuristic plan for the addition of tertiary treatment is also recommended. All the proposed treatment units were designed to achieve acceptable effluent characteristics in compliance with the national Cuban standards, using the least expensive, most traditional, and energy efficient technologies available. 1. This document reflects the collective guidance and review comments from many individuals both within and outside the University of Miami Department of Civil, Architectural and Environmental Engineering. The authors would like to specifically thank the following individuals and organizations for their valuable time in providing ideas and review comments: University of Miami—Dr. Helena Solo-Gabriele; Camp, Dresser & McKee—Armando Perez, Victor Pujals, Stefan Haecker, Ignacio Lizama, Bruce Chalmers, Layla Llewelyn; Hazen and Sawyer—Peter Robinson, Jason Payge.